Well guys, I officially hit my wall. My "I no longer have quite the same amount of energy I used to and I am indeed feeling tired and achy and I can't pretend I'm not pregnant anymore" wall. It happened at 8:34 when I was on my way home a long and busy day. I realized I was absolutely one hundred percent exhausted. At 8:30. Usually I can hold out until at least 10:00. I had big plans for all the writing I was going to do tonight, the emails I was going to answer, the laundry I was going to fold, the trip I need to pack for. Now I'm looking for a way out of all of it. Greg can fold the laundry, I can pack in the morning, emails can wait. As long as I can throw a post up here tonight then I can take a bath and read my book for the rest of the night. Just one post. I'm two days into spring break here. So far it's been an absolute dream. Greg's day off is Mondays so yesterday we slept in, and then went to a doctor's appointment for our baby. They had to do an ultrasound again because last time there were many measurements they couldn't get. Yesterday was the first time we really got a clear shot of her. I felt like I was seeing my baby girl for the first time. She spread her little legs for us to erase any doubt we had that she was indeed, a girl. We saw a perfect outline of her profile. 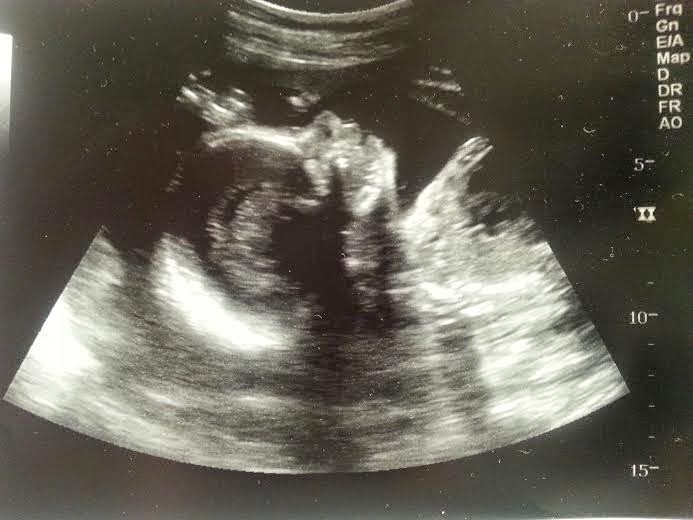 It was absolutely breathtaking to see that little face in there- to see her forehead, her nose, her little lips. Greg says she has my nose, small and a bit upturned. She was moving her lips during the ultrasound- as if she were sucking on some imaginary bottle. Tears ran down my cheeks. Then it was lunch at Olive Garden and a few hours of snuggling, relaxing, and Mario. (We invested in a Wii about a month ago. It has entertained us for hours.) Greg scurried off to rehearsal, and I read on our balcony and just let the spring sunshine pour on me. Maverick insisted on a walk, as dogs do. We got home in time for Jeopardy and all was right in the world. Today my friend, Charlotte, and I decided to head back to Copper Hills to say hi to our people there. Charlotte taught French at CHHS and we left the same year, both finding other jobs closer to home. CHHS doesn't have spring break until Thursday so we felt like if we were going to say hi to everyone, it was now or ever. I felt a little nervous walking into the school again, after almost a year's absence. "Hey guys. Remember me? I used to teach English here... " It took all of about 90 seconds before I felt right back at home. We ate lunch with our old lunch crew, stopped into say hi to the principal, and ran into several old students in the halls. It felt like home. I felt sad for a part of the morning. I think you always do when you revisit an old place- you know you can never quite go back, and yet part of you yearns to. Mostly, though, I felt extremely blessed. Blessed to have had three years at Copper Hills, to have made the friends I did, to feel so loved and accepted there. I also felt grateful for my new school, and the new relationships I've made there. For the opportunity to learn and grow and progress, even though that sometimes involves goodbye to people and places. When I was leaving on my mission, my church leader told me not to feel sad about saying goodbye to my family and friends because my love for them would stay the same. But he promised me that the amazing thing I would discover is that as much love as I had in my heart for all of the people at home, my heart still had room to love so many more people. The heart grows, it expands. It never maxes out on amount of love it can have. He told me that I would grow to love so many people on my mission, and when I came home I'd find that I still loved all the people at home the same- my heart just had more people in it. I think about that a lot. There is no limit on the amount of people that can be let into my heart. If I want to let more people in, my heart will accommodate it. When I married Greg I remember thinking, "How is there even room in my heart to love someone this much?" I had felt like I already had a full heart before I met him, and now here I was, trying to throw an extra giant love in what seemed like an already crowded heart. It's silly, but sometimes I wonder how I can love my dog so much. Where did that space in my heart come from? What was there before he filled it? How will I be able to love a baby? My life is already so full! I guess that's the beauty of the human heart. It loves and loves and loves. I have so much love for those people at Copper Hills, you'd think I couldn't love people at a new school the same, but I do. There's room in there for everyone. I think about all the different circles I've been in in my life, and how there are so many people who have crept their way into my hearts. They don't ever leave, but more people constantly enter. The heart is an amazing thing- a giant room that always feels full to the brim, but never is. I can't help but think about what my heart will look like at the end of my life. All of the people that are in there now will still be there, but there will also be children and grandchildren, future students, future friends. There will be so many more people who will find their way in, and the beauty is that my heart will never tell me that it's filled. There will always be room for one more. I just love this post Bonnie!! I remember thinking the same thing when I fell in love with my husband. "How is it possible to even love someone this much?" The heart is amazing! Wait until you have that baby girl. You will experience a love that you have never known before. It's such a wonderful yet scary feeling. Your heart will heart for the love you will have for her. I'm sure each day you fall in love with her more and more but when you hold her for the first time your heart will ache with growing pains. I can't wait to read that post. Look at you getting all sentimental and mushy. I love it! Such great thoughts. It's amazing how just when you think you can't love any further you definitely can. Whenever I see Rhys on the ultrasound, or look at my strip of ultrasound pictures, I start to cry, as well. I'm so excited to be a mom. It's wonderful just how much your heart can expand. Hey there :) found your blog yesterday and I am hooked!!! can't wait to follow along… you are such a sweetheart! Ok awkward story coming up, but I couldn't help but think of this when I read your post - I have always been kind of indifferent to babies. I never wanted to hold them growing up. I thought they were cute...from afar. I worried that I wouldn't be a good mom. Then one night I had a dream. I don't remember the whole thing, but I remember that in my dream I was a mother. And I cannot express to you how much love I felt for that little one. I woke up the next morning STILL having a full heart. So now, even though I don't know when motherhood will happen for me, I don't worry about it quite as much. Loved this post, as always! is your husband a performer? what show is he in? That's the cutest little baby!!! I love her already! Awe, what a fun day we had at Copper Hills! It was definitely worth giving up a day of spring break to hang out with old kiddos and teacher friends! I love that we brought in our Chick-Fil-a kids meals and walked into the faculty room like we had never left. It is so fun to see familiar faces that even though we had lost touch for months, once we got together, it was like old times again! Thanks for making my spring break so memorable!